McCoys Firehouse | Beer Blotter: Seattle based. World focused. Big Al Brews Suds For Seattle Sounders Supporters. Tongue-twisting title – you bet. Tongue-quenching beer – certainly. Seattle’s Big Al Brewing is at it again with another special contract brew in honor of another Seattle favorite – the Seattle Sounders football club. You might remember that earlier this month, Seattle Beer News‘ editor Geoff Kaiser announced that he had collaborated with Big Al’s Alejandro to make “Hoppy American Wheat Ale” for the Washington Brewers Fest next weekend. Big Al seems to be making quite a habit of creating custom ales for Seattle beer fans. The newest collaboration is called Big Al Brougham Bitter, an English-style session ale that you can find at your next Sounders match. The beer is not contracted by the Sounders’ organization, but the faithful fans at Emerald City Supporters (ECS). ECS is a group of roughly 1300 well-organized supporters that fill the areas of Sections 121-123 at Seattle’s Qwest Field (according to their website). ECS has always had a well-received connection with the folks at Qwest Field. When they heard the cries of fans demanding better beer from the taps at the stadium, they reached out to Alejandro to create the perfect soccer companion – an ESB brewed specifically for the soccer fan. News went out on Seattle Soccer Talk that the beer will debut this weekend at the match against the New England Revolution. The talk says that the beer will actually find digs on four taps at Qwest in Sections 104, 107 and 122! This is very impressive for both Big Al and for ECS. With the Sounders in the dumps right now, its certainly a good time to locate some good beer at the stadium. Considering the play of late – its a bit easier to put down a pint. Big Al is certainly making a big splash with this beer, at this time. With the World Cup starting up next week, many soccer-themed bars in the area might get the hankering to jump on the Brougham Bitter train. This is excellent marketing for a wonderful Seattle microbrewer who continues to improve its beer with every new release. We would not be surprised to see Brougham Bitter at places like the George & Dragon, the Dray, Fado and Kells. ECS works with partner bars in the area, such as Fuel, McCoy’s Firehouse, and the College Inn Pub, all of which are likely to get a taste of the beer. 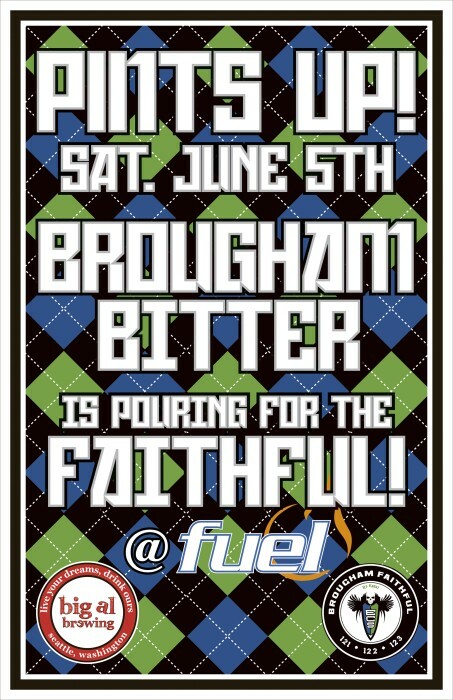 For now, we have been told that the beer will be sold at Pioneer Square’s Fuel, a long time Sounders’ supporters bar (ok ok “long time” is 2 seasons, whatever). The beer is set to debut at 3 PM on June 5th, 2010 during the USA v. Australia friendly. Head over to Fuel and grab a pint.